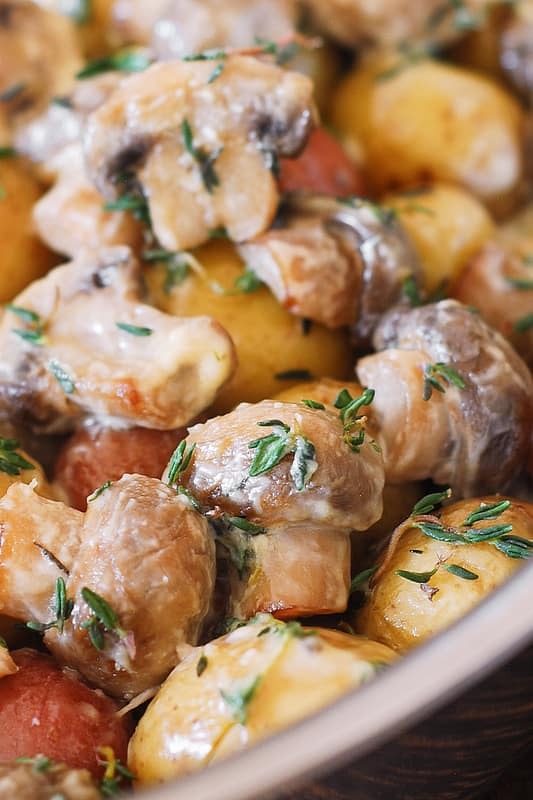 Creamy Garlic Mushrooms and Potatoes with Thyme – easy side dish that will go well with many types of main courses: chicken, pork, or beef! This is one of those recipes that is great to have in your collection when you want a basic but comforting side dish for grilled steaks, pork chops, grilled or roasted chicken, or lamb. It’s very simple: just creamy garlic mushrooms and potatoes coated in a basic cream sauce with lots of thyme! 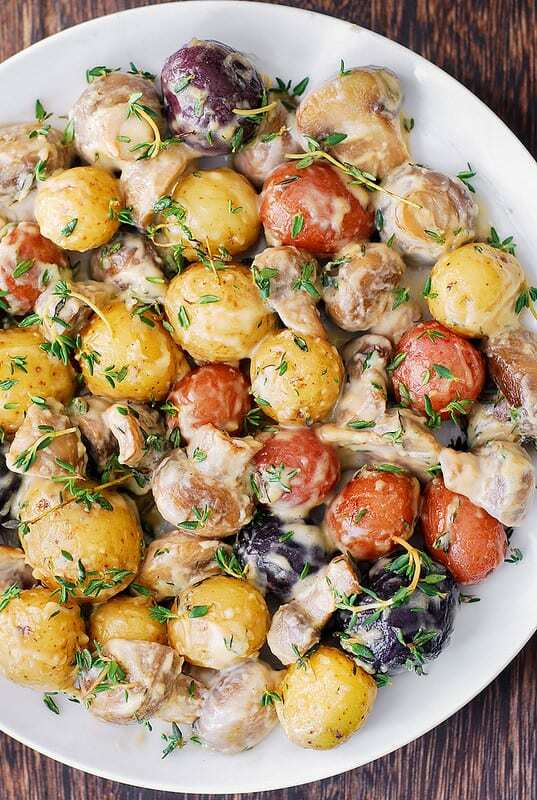 Use the smallest, tiniest potatoes you can find in a grocery store. I used one bunch of three color potatoes (16 oz total). I didn’t even have to slice any of my potatoes in half, since they were already small. 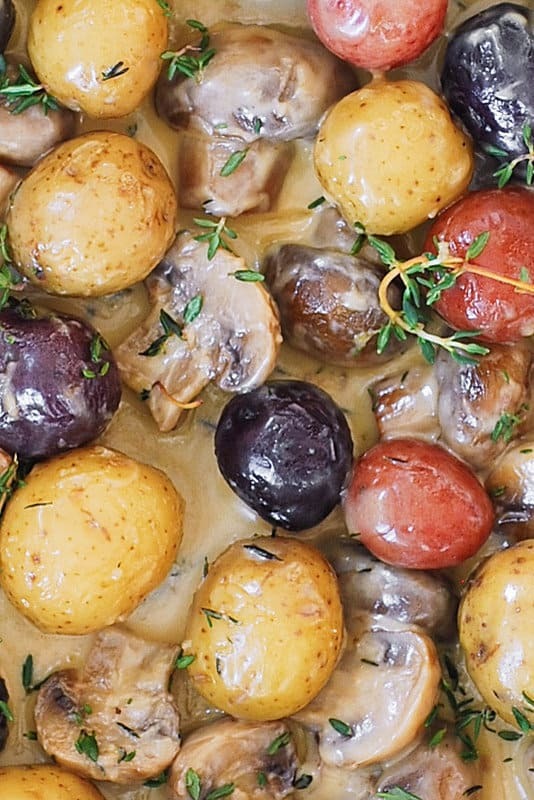 Colorful potatoes + mushrooms sliced in half look great as a side dish! 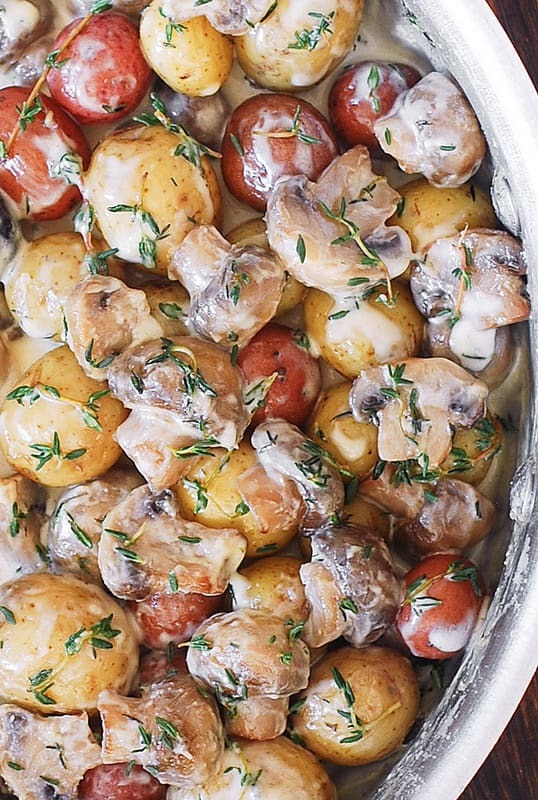 What really adds a ton of flavor to these creamy garlic mushrooms and potatoes is fresh thyme. It’s the best! 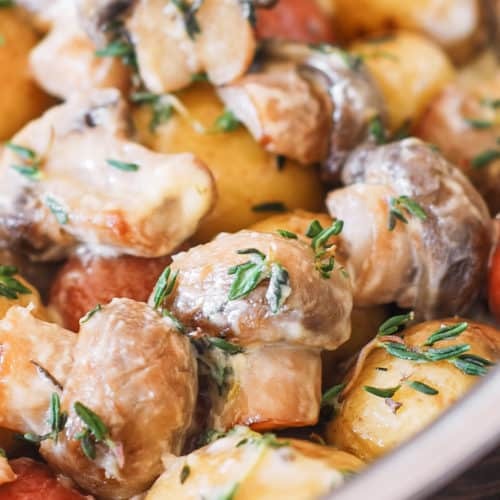 Delicious creamy garlic mushrooms with potatoes and fresh thyme - smothered in an easy-to-make cream sauce! Use small potatoes. Slice larger potatoes in half. Add potatoes to a large pot with water, bring to boil, and cook for 15-20 minutes until the potatoes are cooked through. Drain. While the potatoes are being cooked, in a large skillet, heat 2 tablespoons olive oil on medium heat. Add mushrooms and minced garlic, sprinkle with salt, and cook, occasionally stirring, for about 4 minutes. Add chicken stock to the skillet with mushrooms, bring to boil, reduce heat to medium-low and cook, covered, for 15 minutes. Then, turn the heat up to high and cook, uncovered, for about 5 minutes, until the chicken stock is reduced by half. Add cooked and drained potatoes to the skillet with mushrooms. Add heavy cream and fresh thyme. Cook on high heat, stirring for about 2-4 minutes until the sauce reduces and thickens and starts to coat the mushrooms and potatoes. Remove from heat. Add more salt, if needed. Let the skillet cool off for about 10 minutes which will further thicken the sauce. Stir everything again. Top with extra fresh thyme and serve! So glad you liked it! Freshly squeezed lemon juice over the potatoes and mushrooms sounds delicious!